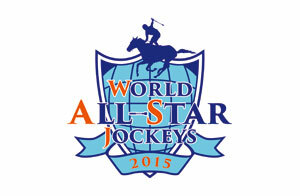 The World All-Star Jockeys is an international event launched by the Japan Racing Association. Formerly called the World Super Jockeys Series since its establishment in 1987, it has welcomed more than 200 top-caliber jockeys from Europe, North America, Oceania and Asia and held on the last weekend of November or else first of December at either Tokyo or Hanshin Racecourse. The series has been altered in schedule and venue this year, and will be held on August 29th and 30th at Sapporo Racecourse on the northern island of Hokkaido. The new edition of this event will welcome five outstanding jockeys from the United States, United Kingdom, France, Australia and Hong Kong to join seven JRA jockeys and two NAR (National Association of Racing; local public racing) jockeys in their bid for the title. A team competition will be added to the regular individual contest this year, in which the overseas and NAR jockeys will form “Team WAS (World All-Star)” and compete against “Team JRA” to attain the most points as a team. The first two of the four-race series will be conducted on August 29th (Sat), while the third and fourth will be held the following day (Sun). substitutes based on recommendations from the NAR by July 28.
c. Seven JRA affiliated jockeys obtaining the following status will be chosen in that order. (Miho Training Center-based) and Western (Ritto Training Center-based) district. The jockey who earns the most points in the four races will be declared the World All-Star Jockeys winner. If a jockey is unable to ride due to scratching or other reasons beyond their control, they will be awarded five points. Any jockey who fails to finish will attain the same points as the last-place finisher in that race. No point is awarded for disqualifications, in which the jockey is at fault. Note: In the case of a dead-heat, each dead-heat finisher will receive full points. b. The participants will also form two teams—the overseas and NAR jockeys will compete against the JRA jockeys—and the team with the most points attained in total will be awarded prizes. In the occasion of a tie, the team that has more jockeys with higher placings in the races will be determined as the winner and will be awarded prizes. Russell Baze is a living legend of thoroughbred racing and an active jockey of over 40 years, continuing to reach unprecedented milestones. At 57 years of age, he is far from slowing down, notching annual wins exceeding 300 and maintaining his position among the top jockeys in wins with purses around 5 million dollars. Coming from a family of horsemen, Russell Baze won his first winner in Washington aboard Oregon Warrior, trained by his father, a former jockey, in October 1974. He moved to California a few years later and has been based there for most of his career, landing numerous titles at Golden Gate Fields and Bay Meadows which closed in 2008. His rise to prominence began in the 1990s. He was honored with a special Eclipse Award in 1995 for being the first jockey ever to win 400 or more races for four straight years since 1992, then, extended the amazing streak to seven in the following years. He was also the leading jockey in wins 13 times (1992-1996, 2000, 2002, 2005, 2007-2009, 2012, 2014). While he has had his share of injuries during his career, he has surpassed legends such as Bill Shoemaker and Laffit Pincay, Jr., both in lifetime mounts and career wins—he has ridden over 52,000 mounts among which he has scored more than 12,600 wins and still counting. Born in Vancouver when his father happened to be competing as a jockey, he was inducted into both the National Museum of Racing Hall of Fame and the Canadian Horse of Racing Hall of Fame in 1999 and 2012, respectively. The state of Washington where Russell Baze began his career also honored him the Sports Hall of Fame in 2012. George Woolf Memorial Jockey Award (2002) is one of many awards that he has received during his stellar career that is the result of his diligent approach to his profession. While he is less frequently seen on big races often held in the eastern side of the US continent, choosing to ride exclusively in Northern California for the past three decades, his many major stakes wins include the Ancient Title Handicap (G1, 2010), the King’s Bishop Stakes (G1, 2005), Santa Monica Handicap (G1, 1991) and the Oak Tree Invitational (G1, 1984 and 1989), and his name is familiar in Japan as the rider of multiple G1 winner Hawkster in the 1989 Japan Cup (5th). Hayley Turner is a successful rider in Europe who has participated in nine Shergar Cups in her native country of England among which she was an individual second in 2007, and boasts numerous records and achievements that her fellow jockeys look up to. She will be under the spotlight this year in Japan as the second female participant in the history of the Series after USA’s Julie Krone in 1990. Born in Nottinghamshire, Turner began taking lessons from her riding instructor mother from an early age, and not long after her jockey debut on March 27, 2000 at Southwell did she claim her first win on June 4th at Pontefract. Steadily gaining experience under Derby-winning trainer Michael Bell based in Newmarket, Turner capped off the 2005 flat season sharing the champion apprentice title with Saleem Golam with 44 wins. It was the first time a female jockey claimed the title, and it was during that memorable season that she was given her first ride at Royal Ascot. In 2008, Turner notched her first group-race win in the G3 Hessen-Pokal aboard Lady Deauville, and not only was she placed within the top five jockeys with the most rides (989) in England, she became the first female jockey to register 100 annual wins (including the winter season). Despite an injury in March 2009 due to a fall which kept her out of the saddle up to mid-summer, she still finished the season with 61 wins. In the 2011 July Cup partnered with Dream Ahead, Turner captured her first G1 victory and became the second female jockey in England to accomplish the feat—her predecessor Alex Greave claimed the G1 Nunthorpe Stakes in 1997—and only a month later, went on to claim her second G1 title in the Nunthorpe Stakes on Margot Did. She also went down as the first female rider to participate in the 2012 Dubai World Cup meeting, again with Margot Did, in the Al Quoz Sprint. After experiencing her first race in the Epsom Derby that June, she captured another G1 title in the Beverly D. Stakes with I’m Dreamer in the United States. Four-time champion jockey Thierry Jarnet is enjoying another successful season with star mount Treve as the pair captured the Grand Prix de Saint-Cloud this June. His successful career is proven beyond doubt as he is a four-time Prix de l’Arc de Triomphe title winner, and may be in line to capture his fifth and third consecutive trophy with Treve once again this year. Coming from the city of Versailles, Jarnet rode his first winner in 1985 at Cagnes-sur-Mer. From 1991, Jarnet signed up to ride as stable jockey for Andre Fabre, and landed his first G1 title in the Grand Prix de Paris with Subotica in his first year. After soaring to second place in the jockey standings at the end of the season, he established himself as France’s top jockey and sat at the summit for the next four years. During his reign as champion jockey, he landed his two earlier Arc wins, one with Subotica in 1992 and the other with Carnegie in 1994. Although he had his share of low-key seasons and injuries since giving up the champion jockey title to Olivier Peslier in 1996, he managed to bounce back as runner-up on the leader-board in 2000 and made a remarkable revival from the 2011 season partnered with Moonlight Cloud, with whom he claimed six G1 victories. He also went on to claim the 2013 and 2014 Prix de l’Arc de Triomphe and the 2013 Prix de Diane with Treve. His impressive career also includes numerous big titles; five Grand Prix de Saint-Cloud and four Grand Prix de Paris victories along with many other French titles. Internationally, he has been seen in the winner’s circle capturing group-one victories in Germany, Italy, Hong Kong and Great Britain including the 2000 Guineas Classic in 1995. He is a known figure in Japan for his four Japan Cup rides; finishing sixth with Wajd in 1991, 14th with Apple Tree in 1994, and seventh in both 2003 and 2004 on board Ange Gabriel and Lune d’Or, respectively. He was an overall third in his first World Super Jockeys Series participation in 1993, and was sixth in 1994, 1995 and 1997. Australian jockey Craig Williams claimed more than ten group races in Australia this season (2014/15) which included capturing the Queen Elizabeth Stakes (G1) with Criterion at “The Championships” meeting in April. The four-time champion jockey also finished second on the leader-board following a heavy battle with Damien Oliver and Dwayne Dunn this year. Born into a racing family, Craig Williams began his jockey career as apprentice in 1993 in Melbourne. He registered his first G1 victory aboard Grand Echezeaux in the 2000 Australasian Oaks, and then embarked on a globetrotting racing career beginning with England where he was successful as first jockey for Mick Channon. He claimed the 2000 Dewhurst Stakes (G1) with Tobougg and marked 43 wins that year in England. He then spent three seasons from 2002 racing in Hong Kong where he rode a total of more than a hundred winners. After returning to Melbourne in 2005, Williams quickly emerged as the leading jockey in the Melbourne region and captured G1 titles such as the Crown Oaks (Miss Finland) and the Victoria Derby (Kibbutz) and prevailed at the summit of the jockey rankings for four consecutive seasons. Craig also rode energetically under JRA’s short-term license every year from 2010 to 2014, while successfully landing major G1 titles in both at home and overseas such as the 2011 Cox Plate (Pinker Pinker), the 2011 Hong Kong Vase (Dunaden), the 2012 Al Quoz Sprint (Ortensia) and the 2014 Australian Guineas (Shamus Award). His stints in Japan have been fruitful as he captured multiple G1 victories beginning with the 2010 Tenno Sho (Spring) (Jaguar Mail), followed by the 2011 NHK Mile Cup (Grand Prix Boss) and the 2011 Asahi Hai Futurity Stakes (Alfredo). He also became the first jockey from the Southern Hemisphere to win the World Super Jockeys Series in 2007 and was second in 2010 while finishing sixth last year. Nicknamed “Magic Man”, Joao Moreira is on the top of Hong Kong’s jockey rankings for the 2014/15 season with 145 wins, which renewed the record of 114 victories set by 13-time champion Douglas Whyte in 2005/06. His partnership with Able Friend, with whom he claimed five G1 victories including the 2014 Hong Kong Mile and the 2015 Champions Mile, and his overseas victories with Brazen Beau in the 2014 Coolmore Stud Stakes and the 2015 Newmarket Handicap in Australia are only part of his many outstanding performances. Born in Curitiba in the southern part of Brazil, Moreira began his jockey career in 2000 based in Sao Paulo and rode more than 1,000 winners in his home country including top filly Bubbly Jane with whom he captured the G1 Grande Premio Diana and the Grande Premio Henrique de Toledo Lara in 2008. He also rode Brazilian champion Eu Tambem to success in the G1 Derby Argentino in 2006 and won the Brazilian Eclipse Award for two consecutive seasons in 2006/07 and 2007/08. His career took off when moving to Singapore in 2009. While finishing third in the jockey rankings with 69 wins that year, the Brazilian jockey secured four consecutive premiership titles between 2010 and 2013—he registered a record of 116 wins in 2010 and went on to renew his own record at an astounding pace, accomplishing 153 wins in 2011 and 206 in 2012. He also accomplished a feat of scoring a perfect eight wins out of eight starts on September 6, 2013. While renewing various records in Singapore, his move to Hong Kong in October 2013 proved to be another great success as he immediately began to accumulate wins and was ranked second in the 2013/14 season with 97 wins despite missing the first month. He captured three G1 titles in Hong Kong and two in Dubai—the Al Quoz Sprint with Amber Sky and the Dubai Golden Shaheen with Sterling City—during that season. While recognized as a globetrotting jockey, Moreira rode in Japan for the first time last year in the Yasuda Kinen where he finished sixth on board Glorious Days. He has also participated in many international jockey competitions, claiming the International Jockeys Challenge in Perth in 2010 and the International Jockeys’ Championship in Hong Kong in 2012. *Mirco Demuro rode in Italy from 1994 prior to acquiring his JRA jockey’s license in 2015. Mirco Demuro takes part in this event for the second time following last year when he represented his native Italy, but for the first time as a JRA jockey. One of the first two foreign jockeys to have acquired their official JRA jockey license in March this year, Demuro made a quick rise to prominence, claiming the Hankyu Hai (G3) within the first week on the job and has already enjoyed the success of capturing the first two legs of the Triple Crown Classics with Duramente, earning a berth in the international “All-Star” jockey competition reserved for the year’s Derby winner. Having ridden in Japan over a 15-year span in a number of short-term riding stints, he became the first foreign jockey to reach 400 JRA wins on July 25. Debuting in 1994 at age 15, Demuro became champion apprentice in Italy with 79 wins in the following year and was leading jockey in Italy for four consecutive years between 1997 and 2000—he became the first teenage champion in Italy. His first group-race victory came in 1998 in the Premio Primi Passi (G3, Solitary Dancer), and his first G1 title in the Gran Premio del Jockey Club (Sumati) in 1999. Demuro sought success at an international level and rode in numerous countries from early in his career. He started riding under a short-term license in Japan in 1999 and found his riding skills well appreciated. Given opportunities on talented mounts, he landed 31 grade-race titles which include 10 G1 victories between 2001 and 2014. He captured his first two Classic titles with Neo Universe in 2003 in the Satsuki Sho and the Tokyo Yushun, and rode lightly regarded Screen Hero to victory in the 2008 Japan Cup. Demuro also gave Japan a historical first success in the Dubai World Cup with Victoire Pisa in 2011. While the horse racing sport in his homeland Italy faced a structural crisis in recent years, Demuro continued to ride not only in Japan but in Europe as well as UAE and Hong Kong when an opportunity for foreign jockeys to ride regularly in Japan came his way. Though failing in his first written test in 2013, his second try last year together with French jockey Christophe Lemaire was successful, and both jockeys passed their second oral test in Japanese to be granted license to start riding year-round beginning in March 2015. *Tosaki rode in regional public racing from 1998 prior to acquiring his JRA jockey’s license in 2013. Keita Tosaki takes part in this year’s World All-Star Jockeys as JRA’s Most Valuable Jockey of the 2014 season, during which he amassed 146 wins including eight grade-race titles, most notably the Arima Kinen (G1) with Gentildonna. His achievements in NAR races as well as his top placing on JRA’s jockey leaderboard that year contributed to his MVJ Award. Tosaki continues to rally for the top spot this year, scoring his 400th JRA career win on June 13. Among six grade-race titles already claimed this year is a G1 title in the Victoria Mile with Straight Girl. Tosaki’s jockey career began in 1998 at Ohi Racecourse as a stable jockey for trainer Kazutaka Katori. He rode his first winner in April that year, reached his 100th win in 2002 and landed his first major title in the Twinkle Lady Sho with Koei Sophia in 2005. With his wins almost doubling from 74 (2005) to 123 in 2006, he was third on NAR’s national jockey rankings with 212 in 2007. It was also the same season during which he won his first JRA win at Hanshin Racecourse in July. This proved to be only the beginning of a remarkable string of success for the four-time national leader (2008, 2009, 2011, 2012) who gained recognition on a wider scale with NAR’s star runner, Furiosowho brought him his first G1 victory in the 2008 Teio Sho and three other G1 titles thereafter. He was also given opportunities on JRA mounts and his first grade-race win at JRA came in 2010 when he won the Musashino Stakes (G3) with Glorious Noahand his first JRA-G1 victory with Real Impact in the 2011 Yasuda Kinen. His third big win came in July 2012 in the Radio Nikkei Sho (G3) with Final Form. Tosaki immediately listed his name among the top jockeys in his JRA debut year in 2013, ranking fifth with 113 wins which included a G1 victory in the Hanshin Juvenile Fillies (G1) with Red Reveur. He was selected to take part in the World Super Jockeys Series for the first time that year, in which he won the first of the four-race series and finished an overall fourth. He was selected again last year, tying for third with a win and a second. Two-time JRA champion jockey Yuichi Fukunaga, who capped off the 2014 season fourth in the national jockeys standings, is currently in intense contention for the top seat this year. He became the 12th jockey in JRA history to earn his 14,000th ride on March 14th, and is about to become the 10th jockey to register his 1,800th win any day now. He has already claimed five graded-race wins this season including the G1 Satsuki Sho (Japanese 2000 Guineas) with Real Steel and a runner-up effort on board Vincennes in the Yasuda Kinen (G1) in June. Following the footsteps of his father, former jockey Yoichi Fukunaga, he made an impressive debut in 1996, winning his first two career starts and named JRA Best Jockey (Newcomer) with 53 wins. His first grade-race victory came the following year with King Halo in the Tokyo Sports Hai Sansai Stakes (G3), and captured his first G1 win with Primo Ordine in the 1999 Oka Sho (Japanese 1000 Guineas). The season was interrupted by a career threatening injury from a fall a week later, but he made a sensational comeback and captured the Asahi Hai Sansai Stakes (G1) with Eishin Preston. The pair successfully proceeded to claim four other JRA grade-race titles in 2000 and 2001, and demonstrated their talent abroad as they captured the 2001 Hong Kong Mile (G1) and two consecutive Queen Elizabeth II Cup (G1) titles in 2002 and 2003. His best season yet was in 2005 during which he grabbed five G1 titles among 16 grade-race wins in Japan, while claiming the American Oaks Invitational Stakes (G1) on board Cesario, the first Japanese-bred and trained horse to capture a U.S. G1 title. At the end of 2011, 133 annual wins carried Fukunaga to the top of the jockey rankings for the first time, and also earned him his first well-deserved JRA Best Jockey (Winning Average) Award. The 2013 season also concluded well after he claimed the Kikuka Sho (Japanese St. Leger, G1) title with Epiphaneia and the Tenno Sho (Autumn) with Just a Way, with whom he demonstrated an emphatic 6-1/4 length victory in the Dubai Duty Free the following year. Fukunaga climbed to the top of the JRA jockey standings with 131 wins that season, which led to both the JRA Award for Races Won and Money Earned. This will be Fukunaga’s third consecutive and seventh challenge in this event, with hopes to top his personal best of finishing second overall last year. Masayoshi Ebina continues to keep his presence as a quality veteran in the increasingly competitive JRA jockey circle with its added talents from overseas as well as the NAR. He is currently seventh on the jockey leaderboard with 51 wins in just over half of the 2015 season despite the misfortune of losing some of his potential star mounts to injury. Ebina scored 30 wins in his debut season and registered his first grade-race win in the February Handicap (G3) in 1992. His first G1 victory was in the Tenno Sho (Autumn) with Bubble Gum Fellow in 1996. One of his best seasons was in 1998, when he claimed the Japan Cup (G1) with El Condor Pasa and concluded his season with 136 wins including 14 grade-race titles. While succumbing to long-time champion jockey Yutaka Take since both made their debut in 1987, Ebina continued to average around 100 wins and finally claimed his first champion jockey title and JRA Award for Best Jockey (Races Won & Money Earned) in 2001. He was also the pioneer in challenging races overseas and rode Fujiyama Kenzan to victory in the 1995 Hong Kong International Cup (G2), four years prior to achievements with El Condor Pasa; two wins in the Grand Prix de Saint-Cloud (G1) and the Prix Foy (G2) and a runner-up effort in the Prix de l’Arc de Triomphe (G1) and the Prix d’Ispahan (G1) during 1999. The year 2010 was another highlighted-season for Ebina, during which he partnered with Apapane, the third Triple Crown Filly in JRA history, while collecting his second JRA Award in 2010 for Best Jockey (Money Won). He also finished second in the Prix de l’Arc de Triomphe (G1) with Nakayama Festa that year. His success during 2014 included the Satsuki Sho (Japanese 2000 Guineas) with Isla Bonita and the Tenno Sho (Spring) with Fenomeno as well as both the season’s two-year-old championship G1 races, the Hanshin Juvenile Fillies and the Asahi Hai Futurity Stakes, with Shonan Adela and Danon Platina, respectively. He finished sixth on the season’s leaderboard with 107 wins and third in purses with over 2.3 billion yen. 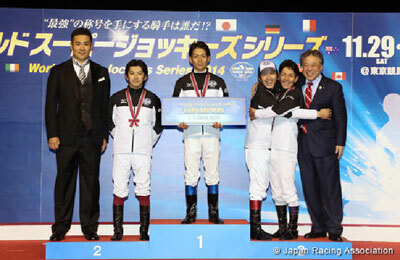 Ebina appeared in eight World Super Jockeys Series events with an overall third being his best score in 2001 and 2003. He was an overall fifth last year while celebrating his 2,300th career JRA win with his victory in the last leg of the series. *Iwata rode in regional public racing from 1991 prior to acquiring his JRA jockey’s license in 2006. Crowned JRA’s Best Jockey (Money Earned) of 2014, Yasunari Iwata marked a milestone of winning his 1,200th race at the end of last season and continues to thrive by having already captured nine JRA and two NAR graded titles so far this year. The 41-year-old jockey guided Let’s Go Donki to a four-length victory in the Oka Sho (Japanese 1000 Guineas, G1), which became his 24th JRA-G1 title, and at the same time, accomplished a great feat of constantly claiming a JRA-G1 win for nine consecutive years. He also partnered with Satono Rasen in showing a runner-up effort to Duramente in the Tokyo Yushun (Japanese Derby, G1) in May. Iwata started his career in 1991 as an NAR jockey and quickly became one of the top jockeys at Sonoda Racecourse in Hyogo prefecture. He was champion jockey in the Hyogo district in 2000, 2002, 2004 and 2005, during which he reached his 3,000th career win. His ambition expanded to the JRA where he became the first NAR jockey to capture a classic title in 2004, in the Kikuka Sho (Japanese St. Leger, G1) with Delta Blues. He finally transferred his license to the JRA in 2006. The Melbourne Cup (G1) victory with Delta Blues in his first overseas campaign highlighted his first JRA season. Since then, he has claimed numerous titles with gifted mounts such as Admire Moon, Vodka, Victoire Pisa, Buena Vista, Lord Kanaloa and Gentildonna, and has so far registered 22 G1 titles among a total of 68 grade-race wins in JRA. Especially in 2012, he not only marked a tie-record of capturing six JRA G1 titles in a single year, but grabbed the NAR’s Tokyo Daishoten (G1) and earned international acclaim by bringing home the Hong Kong Sprint (G1) title with Lord Kanaloa. He is a two-time JRA Best Jockey (Races Won) of 2011 and 2012, and four-time JRA Best Jockey (Money Earned) of 2008, 2011, 2012 and 2014. Apart from 2010, Iwata has continuously competed in the series from his first challenge in 2005, in which he finished at the top, and this year his fans are expectant of his much-awaited second series title. *Shibayama rode in regional public racing from 1998 prior to acquiring his JRA jockey’s license in 2005. NAR-turned JRA jockey Yuichi Shibayama registered his ninth JRA grade-race victory, the first in six years, winning this year’s Flower Cup (G3) in March with Albiano, with whom he finished a close second in the G1 NHK Mile Cup in May. While still without a G1 title, he is showing great improvement this year and is likely to exceed his personal best of 80 wins which he achieved in 2005. He will be participating in JRA’s international jockey competition for the first time. Born in Osaka in a family with no horseracing background, Shibayama took the exam to enter the JRA Horse Racing School with the encouragement of his mother who had seen a documentary about the jockey school, but failed three years in a row. He then opted to enter NAR’s jockey school and debuted at Kasamatsu Racecourse in 1998. Scoring 12 wins that year, he steadily extended his wins and was ranked fifth on the jockey’s leaderboard with 91 wins in 2003 and fourth with 89 wins in 2004. While accumulating 393 wins in NAR in 2005, Shibayama decided to try for the JRA license with the recommendation of Katsumi Ando, the first NAR-turned JRA jockey who was also based at Kasamatsu, and succeeded in becoming the fourth jockey to transfer from NAR to JRA. His debut year as a JRA jockey was quite impressive as he marked 80 wins, which included his first JRA grade-race title in the Chunichi Shimbun Hai (G3), and came in 11th on the leaderboard. While landing several grade-race victories including the Nakayama Kimpai (G3) in 2006, St. Lite Kinen (G2) andNAR’s Hyogo Junior Grand Prix in 2007, the Nakayama Himba Stakes (G3) in 2008 and the Sapporo Kinen (G2) in 2009, he endured a low-key period over several seasons before making a steady comeback, registering 49 wins in 2014 and currently standing at ninth on the leaderboard this year with 47 wins as of July 26. Yutaka Take is a highly decorated veteran jockey who reached his 3,700th JRA win and a career total of 19,000 rides in March this year. He is currently fourth in the jockey’s standings with 61 wins that include the February Stakes (G1) with Copano Rickey and three other grade-race titles. Yutaka is the third son of jockey-turned-trainer Kunihiko Take, and elder brother to Koshiro Take, also a fellow jockey. Take rode his first winner in his debut year in 1987, when he scored 69 wins which earned him the season’s JRA Award Best Jockey (Newcomer). He has and continues to renew practically every record available along with what he himself has set, not to mention the 2005 record of 212 wins in a single season. He has also reigned as leading jockey for 18 years, including nine consecutive years from 1992 to 2000, and seven from 2002 to 2008. He has enjoyed successful riding spells around the world and has achieved grade-race wins in France, England, the United States, Dubai and Hong Kong. In 2005, he excited the nation by landing the Japanese Triple Crown (Satsuki Sho (Japanese 2000 Guineas), Tokyo Yushun (Japanese Derby), and Kikuka Sho (Japanese St. Leger)) on the legendary colt Deep Impact who brought him four other G1 titles. In 2007, the star jockey’s career was highlighted by another extraordinary feat as Take, at 38, broke another JRA record for most career victories—2,944 wins—and posted his 3,000th win at Kyoto racecourse on November 3rd. Reaching 3,500 wins in January of 2013, Take celebrated his 100th G1 (NAR and overseas included) victory when claiming the Mile Championship with Tosen Ra in November that year. As of date, he has a record of 298 grade-race wins in JRA alone among which 69 are at G1 level. Since his first JRA Award as a newcomer, he has won 18 jockey titles for Races Won, 16 for Money Earned, 11 for Winning Average and nine Grand Prizes, given to those that have dominated all three jockey categories in the same season. Take has participated in the World Super Jockey Series 20 times since 1988, having finished a runner-up overall five times and capturing the title in 1992. Koji Fujita, last year’s runner-up in the jockeys rankings at NAR Kanazawa Racecourse, registered his 700th career win in June this year and is pursuing the leader by just two wins with 44 wins as of July 23. Fujita captured back-to-back victories in the last two legs of the four-race Super Jockeys Trial, which serves as a qualifier for the World All-Star Jockeys, to become the NAR delegate for this year. A native of Ishikawa Prefecture, Fujita made his debut in April 2001 at Kanazawa Racecourse, riding for the Hiroaki Shimizu Stables. He registered his first win in June and concluded his debut season with six wins. He accumulated 17 victories the following year and increased the number to 24 in 2003 after transferring to the Shozo Minami Stables. After another move to the current Yutaka Kuroki Stable in 2004, he registered his first major title in the Asunaro Sho with Kikuno Raiden and marked 20 wins. His annual wins started to improve from 2006 when he scored 37 wins. Once making the top ten for the first time with 42 in 2007, he steadily climbed up the leaderboard, ranking in seventh with 53 wins in 2008, sixth with 55 wins in 2009, fifth with 63 wins in 2010, fourth with 62 wins in 2011 and second with a career-high 92 wins in 2012, which included his Kita-Nippon Shimbun Hai title with Aludra. He has established himself as one of the top jockeys in Kanazawa as he marked his 500th career win and finished third with 84 wins in 2013 and was runner-up again the following year with 90 victories. During the winter season when Kanazawa Racecourse closes down due to snow, Fujita refined his skills by riding in the Tokai district and has also been riding at the JRA Miho Training Center since 2008 as an exercise rider. The 2014 Hokkaido Champion Jockey Yuji Iwahashi, with the most number of wins between April 2014 and July 23, 2015, will represent the Hokkaido district to participate in the World All-Star Jockeys which will be held at Sapporo. He will be the first Hokkaido-based jockey to participate in this series. Born and raised in Saga Prefecture in Kyushu Island, Iwahashi finished ninth in his debut race at NAR Saga Racecourse on October 17, 2001 and registered his first win 17 days later. After scoring three wins out of 74 starts the following year, he moved to NAR Hokkaido in 2003 and marked 18 wins that year, riding for the Haruo Narita Stables. He captured his first major title in the Kagetsu Sho on board Dream Chatter in 2005 and was ranked 16th in Hokkaido’s jockey rankings with 26 wins. The pair went on to claim two more titles in the Himawari Sho and the Beautiful Dreamer Cup the same year. He claimed the Kitakamigawa Daishoten with Juke Joint at NAR Iwate in 2008 and also raced at Nagoya Racecourse in Aichi Prefecture for two months from December the same year. He finished 10th in the Hokkaido jockeys ranking in 2010 with 42 wins. Moving to the stables of Junji Tanaka, one of the top trainers in Hokkaido, with the retirement of Haruo Narita in 2011, he captured the Okan Sho, the last leg of the Hokkaido Triple Crown, with Beauty Riyo and was sixth on the leaderboard with 63 wins. He was sixth again in 2012 with 66 wins, improved to third in 2013 with 80 wins and finally reached the top in 2014 with 101 wins. His major titles claimed during this period were 2012 Sapporo Classic Cup with Angel Tweet, 2012 Breeders’ Gold Junior Cup with Kaikayoso, 2013 Breeders’ Gold Junior Cup with Pop Label, 2014 Fleur Cup with Copano Heart and 2014 Etoile Sho with Grand Vin. Note: The Hokkaido racing use to be held at several racecourses in Hokkaido including JRA’s Sapporo and Hakodate racecourses, but is held only at Mombetsu Racecourse located in Hidaka, which is a major horse-breeding region in Japan, since 2010.